Edward is the son of Edward Franklin and Lulu Witham Wyborny. The picture was taken at the Bollman family reunion near Decorah, Iowa in July 2003. 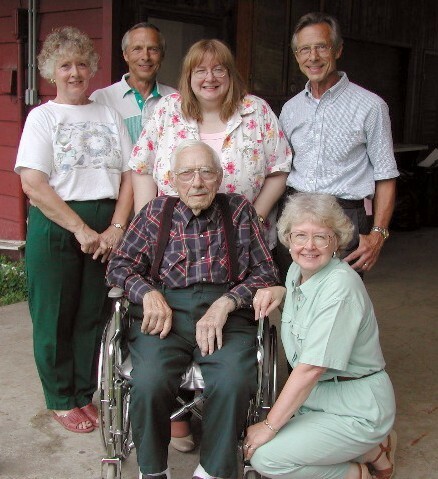 Front row: Ed Wyborny and Kathaleen Meinholz; middle row: June Dodd, Carol Wyborny, and Raymond; back row: Richard; not present: Elton and Inez Bollman Wyborny (wife and mother) who passed away in 1994. Recently Ed fell and broke his leg. He is now convalescing at the Stone County Nursing & Rehabilitation Center in Mountain View, Arkansas. Ed celebrated his 92th birthday on November 29th 2003. This picture was taken in July 2003 at Mark Wyborny's home in rural Rock Falls, Iowa. Picture is from Richard Wyborny of Charles City, Iowa.